This week, my thoughts have turned back to bourbon. Perhaps it's the chill in the air that makes the smooth vanilla and spice of a rye bourbon seem so appealing right now...? Perhaps I'm running out of Gin-spiration...? Whatever the reason, it felt like the time was right to crack open the bottle of Buffalo Trace (again) and mix up some new drinks. Any regular readers will know that bourbon is not necessarily my drink of choice, but I have mixed up the occasional Manhattan and in an earlier post, (Kentucky Fried) discovered that given enough of a cocktail makeover, bourbon has what it takes to be a tip top tipple. Obviously, hardened bourbon drinkers may crack their hairy knuckles in consternation, but that's just fine; they can continue to swig it neat from a chipped mug and good luck to them. I, on the other hand, will be taking my medicine with a large spoonful of sugar and probably some lemon and mint. It might not be macho, but it sure does taste swell. Bourbon is a grain spirit, made, using predominantly corn (at least 51%), but the remaining 49% can come from a combination of barley, rye and wheat. Using more wheat than rye will result in a smoother, creamier bourbon as wheat allows the sweetness of the corn and the vanilla (from ageing in oak barrels) to shine through. A bourbon made with rye will have a higher concentration of spice notes such as pepper, nutmeg and cinnamon. 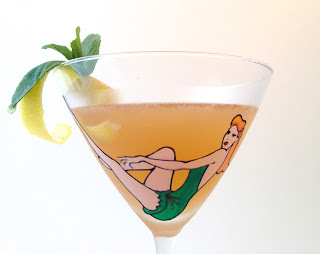 It typically has more 'bite' than it's wheatier counterparts and the end result of your cocktails will vary depending on the type of bourbon you use. Buffalo Trace contains rye and is therefore a little spicier, but is by no means at the spiciest end of the spectrum. It's a good, all round bourbon that adds a little bite without totally overpowering. That said, don't be afraid to experiment with other bourbons - you might just find your new, favourite drink. 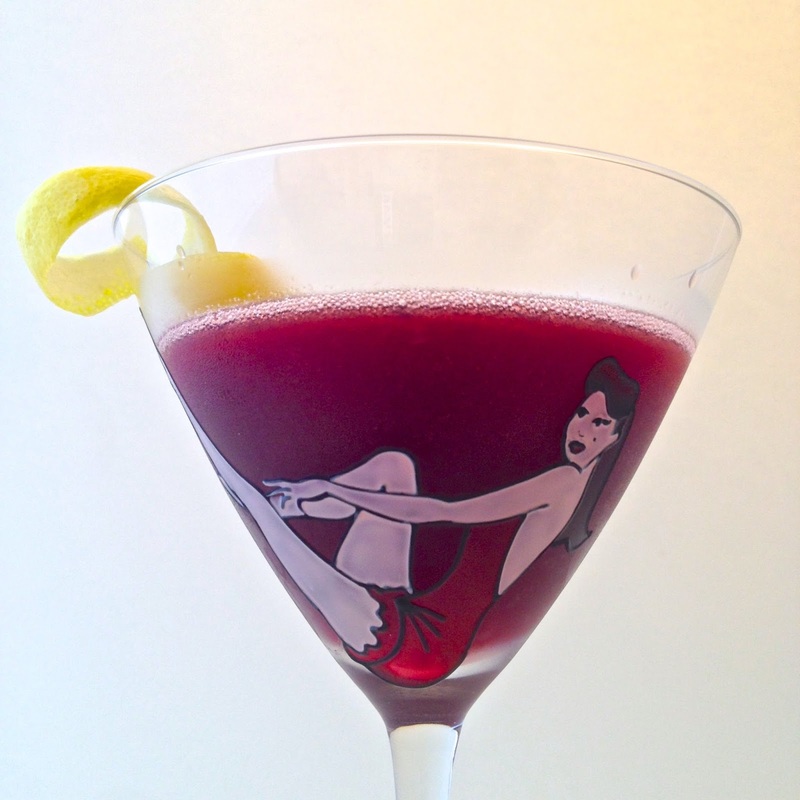 One of my favourite cocktail ingredients, of late, has turned out to be ruby port. It seems that barely a week goes by when I'm not sneaking in yet another port based beverage and surprise surprise, I'm at it again. Before cutting your lemon to squeeze it, use a sharp knife and cut a wide strip of zest from your lemon. Add everything apart from the the lemon zest to a cocktail shaker with a handful of ice. Shake hard for 20 secs and strain into a chilled martini glass. This next cocktail is basically a martini style version of my 'Bird on the Wire' cocktail, created as a bespoke cocktail for a client, but I'm sure they won't mind this apprehension and adaption of their drink. Some things are too good to keep under wraps..
Before cutting the lime to squeeze it, take a paring knife and cut a strip of zest from the peel. Halve the passion fruit and scoop out the pulp and add to a cocktail shaker. Add everything apart from the zest and muddle (squish)the mint leaves to release their minty essential oils. Add a handful of ice and shake hard until the outside of the shaker develops a frosty bloom. Strain into a chilled martini glass and garnish with a twist of lime zest. This last cocktail combines Buffalo Chase bourbon with Cartron Creme de Peche de Vigne which may not seem like an obvious pairing, but actually, peaches are big news in the Southern States and the fruit pairs well with the vanilla, spice and nuttiness of bourbon. I am a huge fan of the fragrant taste of peaches, but when it comes to alcohol, not all peach liqueurs are made the same, but Cartron Creme de Peche is made using lots of beautiful vine peaches and is bursting with natural flavour. When making this cocktail, ensure that you use a peach liqueur that is made using the 'creme' method of macerating real fruit and contains no artificial flavouring. Before cutting your lemon to squeeze it, use a sharp knife and cut a wide strip of zest from the peel. Add everything apart from the the lemon zest and sprig of mint to a cocktail shaker with a handful of ice. Garnish with a twist of lemon zest and sprig of mint. Tip - slap the mint gently between your palms to release the aroma, before garnishing the cocktail. 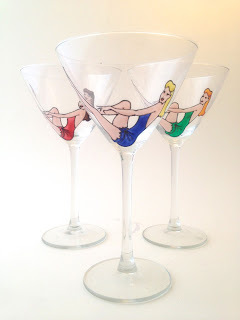 This week's cocktails were served in these Vintage Pin Up cocktail glasses; The Scarlett O'Hara cocktail was brought to you by lovely brunette, Jane; Southern Passion came courtesy of bombshell blonde, Marilyn and Kentucky Peach was served up by lovely Rita, redhead. Who's your favourite?